This page contains various screenshots showing off Exordium’s functionalty from a user’s perspective. Exordium Main Screen, showing recently-added albums. All lists of albums will show the number of tracks, total album length, the released year of the album, and the date added to the library. The sidebar will be present on all pages. The “administrative links” at the bottom of the sidebar will only be shown to logged-in users who are set to staff. 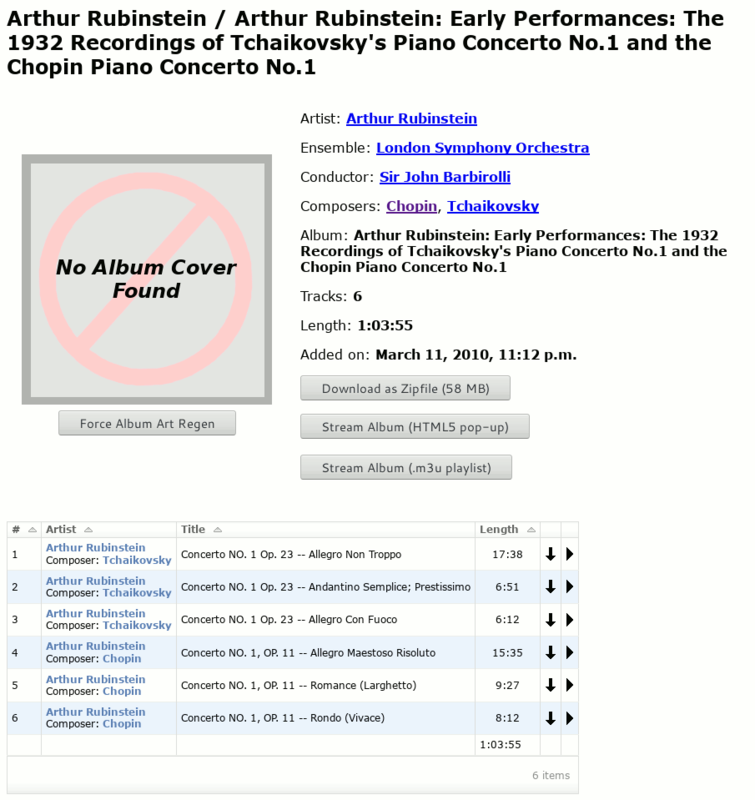 The sidebar contains a textbox to search through the library, and a checkbox to either include or exclude live recordings while browsing the library. Live recordings are albums whose title is of the format “YYYY.MM.DD - Live*”. 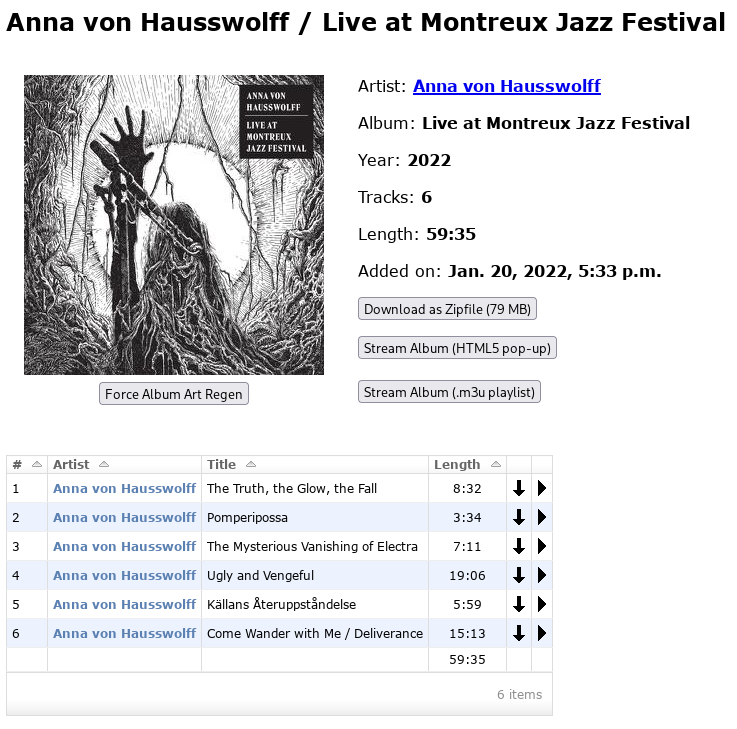 Logged-in users will have their live-album preference saved between sessions. This view will show the number of albums and number of tracks. Clicking on an artist name will bring up a list of albums and songs by that artist. Browsing all albums/songs by an artist. Tracks by an artist which don’t have an Album tag will get sorted into a special “Non-Album Tracks” album, as can be seen here. After all the albums explicitly belonging to the artist have been shown, any “Various Artists” album they appear in will be listed. 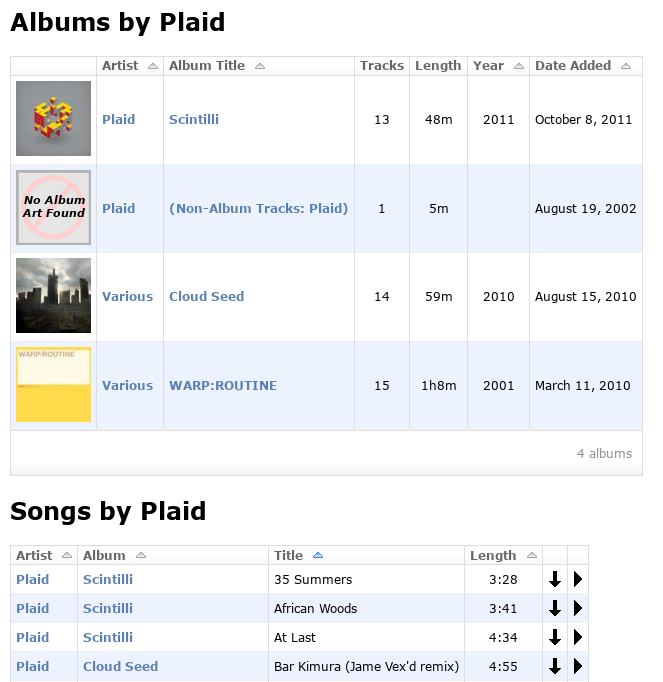 In this case, Plaid can be found on two compilation albums. Below the album list will be a song list. Each song will have two icons on the right-hand side of the table. The first, the arrow pointing down, provides a direct link to the track. 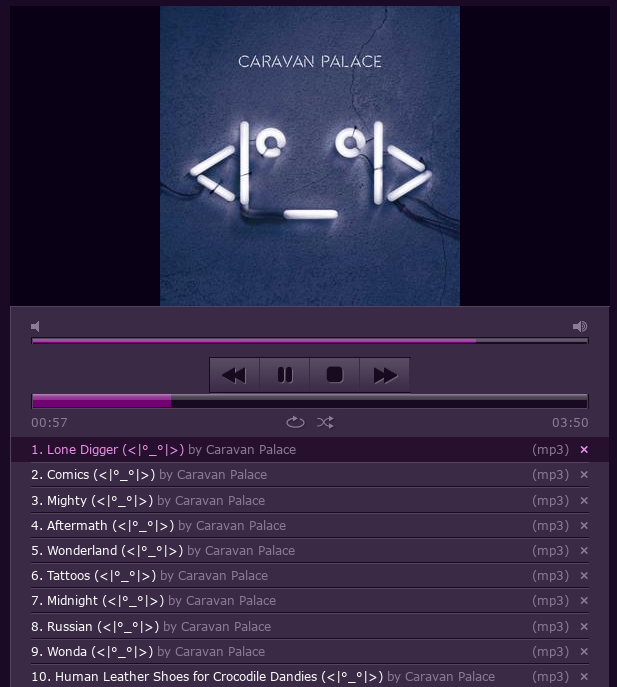 The second will open up a popup window with the HTML5 media player jPlayer, which will then stream the track. Clicking on more than one track will add the track to jPlayer’s playlist. Artists with more than 500 songs will not have their song lists shown here, for performance reasons. The “Browse Albums” view will sort by Album Title by default. After clicking on an album link, a full page will be shown containing all the album details. 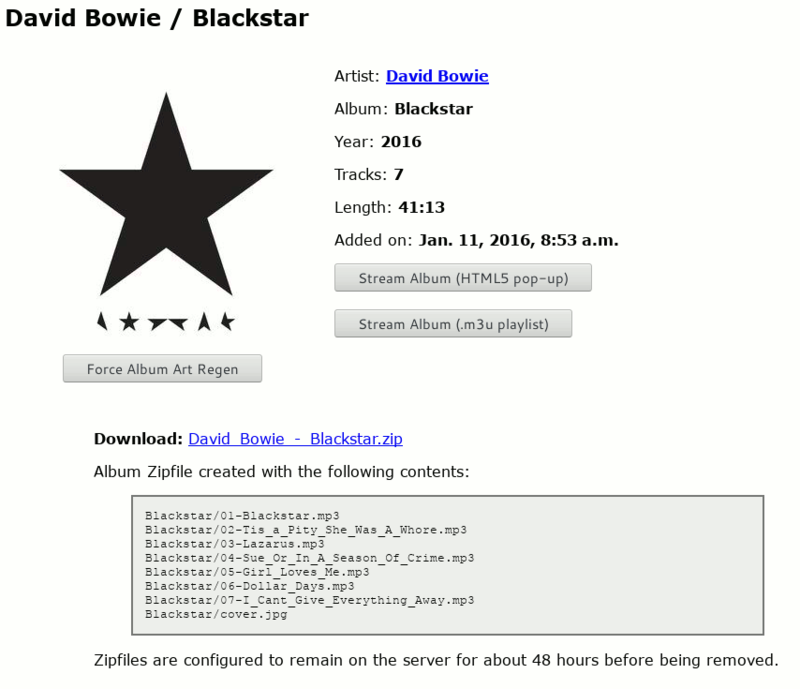 If zipfile downloading is configured, a “Download as Zipfile” button will be shown at the top. The two streaming buttons will be shown in any case - the first will open the HTML5 media player jPlayer in a popup window, and the second will generate an .m3u playlist which other media player applications should be able to use. The “Force Album Art Regen” button will only be visible to logged-in staff members, and will tell Exordium to look for new/updated album art in the album’s directory. 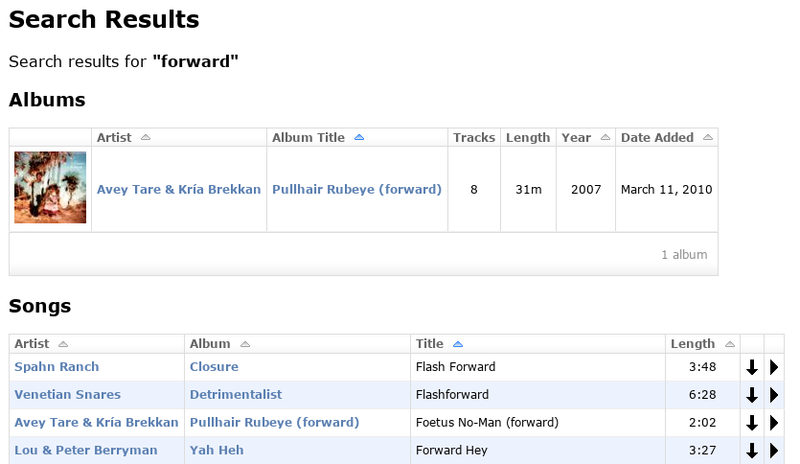 A list of all tracks in the album is shown after the summary information. Like in the Artist view above, each track will have a download and stream button. Exordium supports tags for Ensemble/Group, Conductor, and Composer. These are most commonly seen with classical music, though of course they can be used on any track. Any tags common to all tracks in the album will only be reported up at the top section of the album view screen. 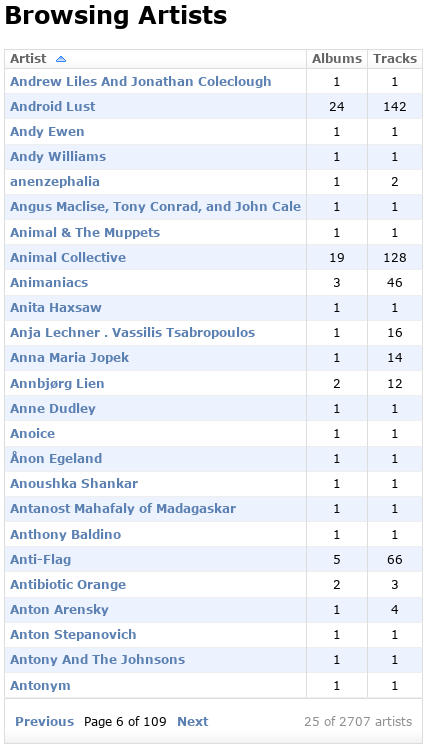 Those which may differ from track-to-track will be inserted into the Artist column in the song list, as seen above. Clicking the “Download as Zipfile” button will result in a page showing you the exact zipfile contents, and a link directly to the zipfile (using your configured Zipfile URL as a prefix). If the download link is clicked again while the zipfile is still present, Exordium will just provide a URL to the existing file, rather than regenerate. 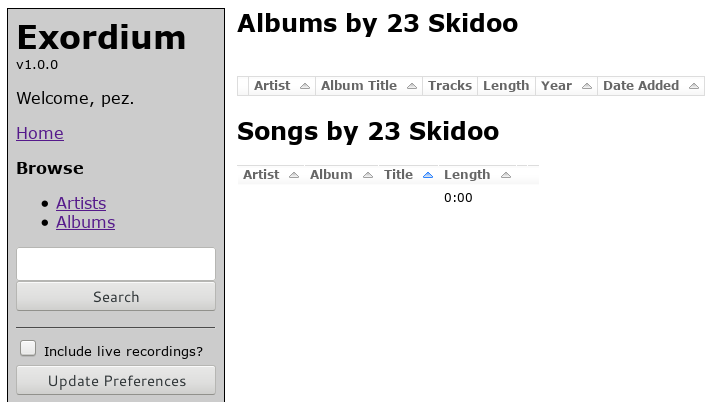 The search box will match on artist names, album names, and song titles, and will show all relevant hits of each type. The screenshot above matched on an album name and a bunch of track names. The HTML5 media player jPlayer is used to handle in-browser streaming, via a popup. It’s not fancy, but it gets the job done. It turns out that this player will even work on Android phones (and possibly iPhone, though I don’t have one of those to test). Screenshots of the administration sections can be found in Administration.